Is Colombia Responsive to Sexual Violence Victims & justice? During her visit, Ms. Wallström met with survivors of sexual violence, representatives of victims associations and Government officials, as well as with the ombudsman and the Inspectors-General of the army and the police. She was reviewing follow through efforts at peace after a pro-longed multi-headed civil conflict by reviewing efforts to reintegrate combatants as well as address needs/relief for victims of sexual violence. 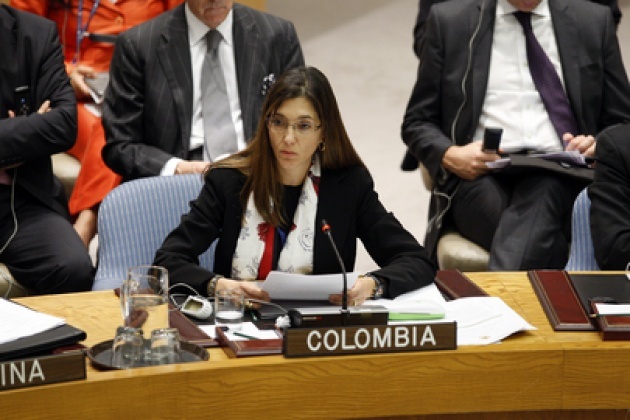 Film for Blog Report - "Women as Enemy"
UN Photo - Patti Londoño, Deputy Minister of Multilateral Affairs of Colombia, addresses the Security Council’s meeting on strengthening international cooperation in the implementation of counter-terrorism obligations.